I've just re-started into the wonderful world of chickens and loving it even more now that I've grown up! I live on a little 3.5 acre ranch with my husband, blue heeler, border collie, 6 horses (2 of which are yearlings) and my chickens of coarse. I have a small mixed flock of 4 EE hens and 2 EE roos, 1 black leghorn, 1 white leghorn, 5 white rocks, 1 Wellies,1 Barred rock, 1 Rhode Island red, 1 red banty Cochin, 1 banty Minorca, 1 buff Orpington! 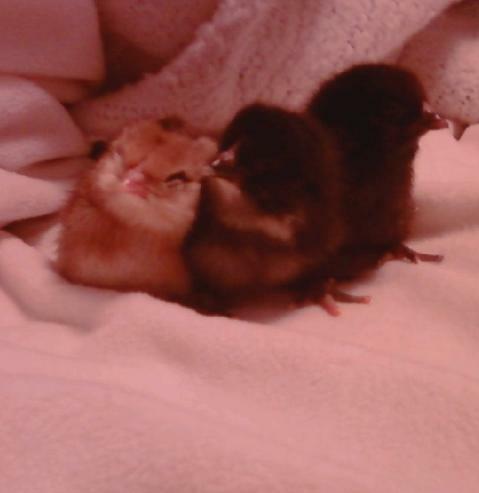 On Feb 6 2010 my little red Cochin hatched her first babies. My husband and I will have been married 1 year this August and made such great leaps and bounds durring that time. We bought our first house, our little ranch and have had so many joys and "joys" of home owenership. But live where it's very quiet and get to be the neighborhood babysitters since all the kidos LOVE horse rides (but who doesn't?). This is our little colt born just as I was getting home from work, "Squirt." He was going to be named Ricochett since he would just seem to ricochett around the pasture like foals do... be we decided he was just a little squirt so that ended up sticking.